I might have been a little biased at the beginning about the Dorsett Kuala Lumpur. Even though I had the luxury of a premium flatbed on my AirAsia flight from Australia to Malaysia, it was 4 am by the time we arrived here, and I was ready for a rest. Arriving at the airport, almost 60 kilometres away would usually take an hour or more. In the wee hours of the morning, we were there in around 40 minutes. My entry to the hotel couldn’t have been more streamlined or welcoming, just what you need at this hour of the morning. With a quick copy of my passport taken and a few basic identifying details taken, I was on my way to the 19th floor, with my luggage following closely behind. The room was very large, especially in south-east Asia where many would have a perception that the rooms are small. For now, my assessment of my room needed to take a back seat. The comfy looking king size bed was calling! I did, however, see the beautiful bowl of fresh fruit and a special gift left for me. Always lovely to feel so welcome when you arrive at a hotel. 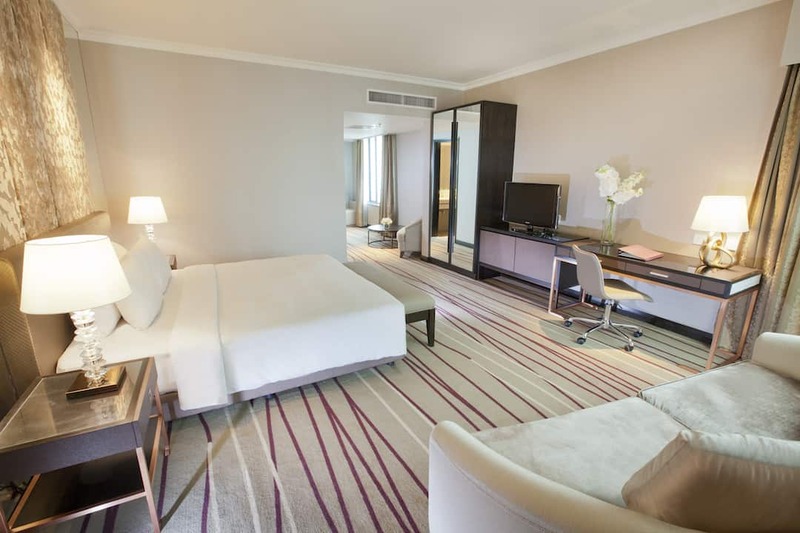 There are five different types of rooms at the Dorsett Kuala Lumpur, a centrally located hotel, providing a range of options and inclusions for every type of traveller. I stayed in the Dorsett king room, an entry level room that offers a good level of comfort and space. At 30 square metres, this is more than generous for a hotel room and allows for the inclusion of a two-seat sofa and a decent size desk. Recently renovated, all rooms have large 40-inch flat-screen TVs, with in-house movies and international channels. By the time you’ve stayed in a few hotels in a row you get sick of BBC or CNN and their repetitive news cycle, but it’s nice to hear a little from the outside world.There is a powerpoint on one side of the bed, however, no USB ports for charging devices. Heavy drapes cover the large windows with a view over the city. Most rooms in this hotel have a reasonable view. The shower is spacious also with the option for a handheld shower or a rain shower with a greater volume of water. Loving lots of pressure and hot water as I do, this was, of course, my preference. The family rooms are the same size as the Dorsett rooms but come with the option of a king bed and king-single or three single beds. All family room guests are also treated with the inclusion of the Dorsett bear. A sure treat for kids. 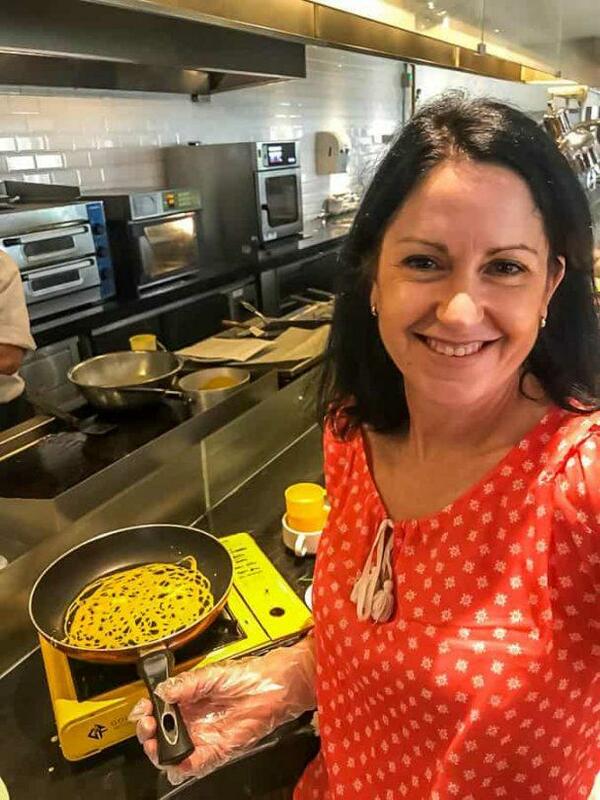 Kattie Hoo, Director of Marketing and Communications at the Dorsett KL noted that “those who book the family rooms get all kinds of special treats, from little chocolates to a library of books to suit the age of the children staying there”. A nice personal touch! The Deluxe Premier King rooms continue to bring the same level of comfort, albeit in a slightly larger room. With around 38 square metres of space, the room allows guests to spread out more in the living area. When it comes to real luxury, the suites at the Dorsett have it. With separate living areas and 45 square metres of space, a large walk-in bathroom and a desk with a special city view, it’s the perfect respite for business people or those who just love plenty of space. At 60 square metres and with only six available in the hotel, these are the most prestigious suites. Similarly to the Dorsett suite, the Executive has a separate living area but also features a large two-way bathroom, connected between the bedroom and the living area. There’s also a large bathtub to soak away all the worries of the day and some amazing views from the floor to ceiling windows. Note- The Dorsett Kuala Lumpur has floors dedicated to those who smoke. If you are a non-smoker be sure to book the correct room. Located adjacent to the Dorsett Kuala Lumpur are the Dorsett Residences. These luxury apartments offer studio suites and two bedroom suites which are luxuriously appointed, self-contained and are perfect for travellers wanting to stay for an extended period of time. 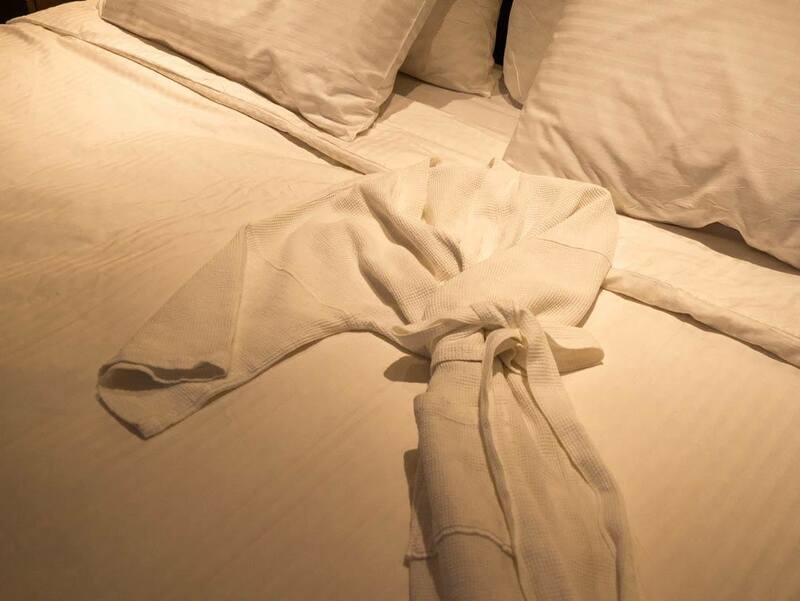 There is a minimum three-night stay applicable to the residences. The rooftop level also has a pool with sweeping views over the city and the Petronas Towers. 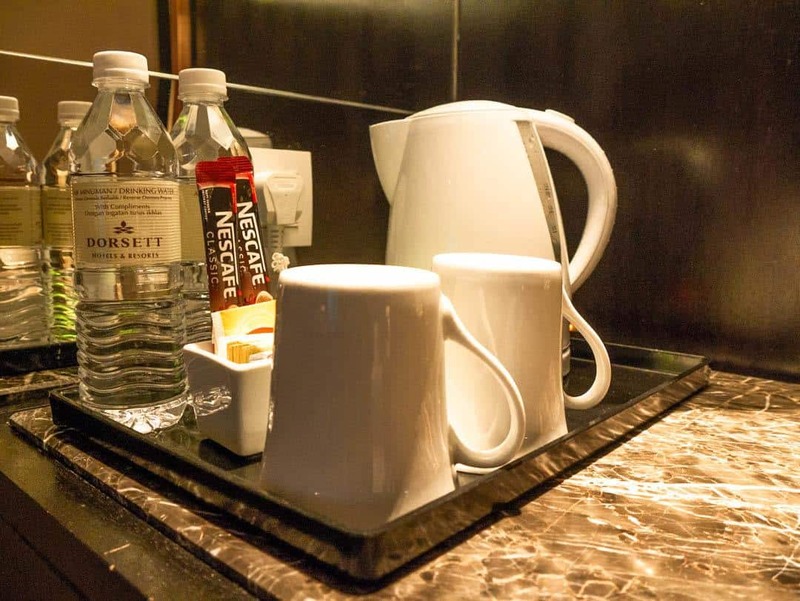 The amenities are basic, with a variety of tea and instant coffee provided. Complimentary bottles of water are provided each day which is nice to have. The toiletries (shampoo, bath gel and body lotion and various other items) are a standard provision. Waffle-weave bathrobes and slippers are also made available, as is a modestly stocked mini bar, safe and iron/ironing board. A nice touch was the reusable shopping bag that is provided in every room. Always present in good hotels, the pool and gym are located on level four. I love how this pool is located outside where it’s warm enough to really savour the cool water. Food is something that usually makes or breaks a stay at a hotel and with an ever-increasing array of options and armchair critics, the food usually has to be at the top of its game. At the Dorsett Kuala Lumpur, dining is a casual affair. The main cafe, Checkers, offers all-day dining in a buffet style. Traditional Malaysian food is offered as well as a large range of western food, to suit every guest’s dining requirement. Each month, a themed buffet lunch and dinner is offered in the cafe. I lined up for a taste of Malaysia on my first morning here and wasn’t disappointed. It was also great to see the chef cooking live from his station, flames being thrown about from the dish he was preparing in a huge wok. There’s nothing quite like a huge hit of a chilli sambal to get your taste buds (and the rest of you!) going in the morning. If this isn’t your style, you can always head to the made-to-order eggs station. The appropriately named Windows Lounge just off the lobby provides another casual area to either wait for your travel party to join you or enjoy a drink at the end of a long day. There’s also a small cafe here where you can buy light food items and pastries. It’s been a growing worldwide trend now for some time and one which we obviously embrace. People the world over, irrespective of culture, love food. They love eating it, learning about it, doing food tours and learning how to cook it. The Dorsett Kuala Lumpur have picked up on this and are now looking to introduce group cooking classes from November. How wonderful then that the group I was travelling with was able to experience this first hand with the chefs. With a huge smile on their faces, they took us through the process of making roti jala first, before handing over to us to re-create. Roti Jala means “net bread” which is obvious when you see the lacy pancakes made from the thin pancake-like mixture. They are most popular in Malaysia as an afternoon snack and usually associated with a tasty curry. I’d be happy to eat these any time of day. Whilst we watched the chefs then make a chicken curry, I personally would have preferred to have been able to make this myself also. Making curries, especially from scratch is one of the best ways to be able to experience all the flavours that go into it. Perhaps it was just our limited time we had available? Lunch in Checkers Cafe was a flowing buffet of internationally inspired cuisine, delivered to our table. This was our first catered meal on this trip and we quickly learned that generosity with food is key. A bit like the mantra in my own household, no-one would ever go hungry here. 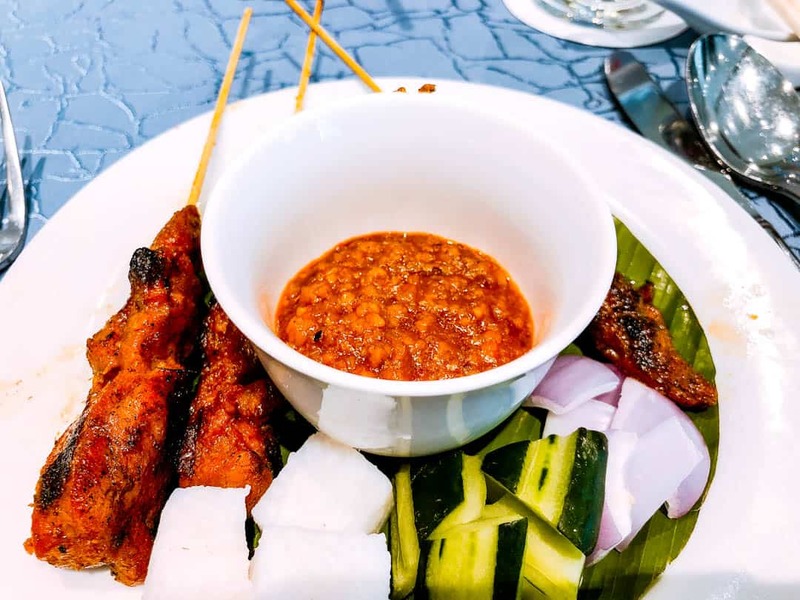 Moist chicken skewers, reflecting the Malay-Chinese culture, made with freshly made peanut sauce are one of my favourite “street foods” and this didn’t disappoint. I could have easily just had these for lunch and would have been perfectly happy. Cantonese noodles with egg gravy arrived in a large bowl, full of finely sliced, poached chicken and vegetables. The egg gravy takes some getting used to. The flavour is there, it’s just a texture that many people would find unsettling at first. It’s gelatinous and gooey and looks a little interesting with the cooked egg white floating through it. It goes perfectly with the contents of the dish though. The subject of our cooking class, the roti jala and curry arrived next and clearly represents the Indian influence in Malaysia. With one hand I scoop up the chicken curry (with a spoon of course! )and the other is used to dip the roti into the luscious sauce. Sweet and sour fish based on a Chinese recipe is next, then vegetables, something that is served as a separate dish at every Malaysian meal. The final dish, a dessert, was a revelation. Firstly, because I ate sago, which is not something I usually do. Secondly, for the unintended and inspiring flavours, we all took in from the palm sugar syrup. Sago gula melaka, is a Malaysian dessert served cold, using sago of course and coconut milk. 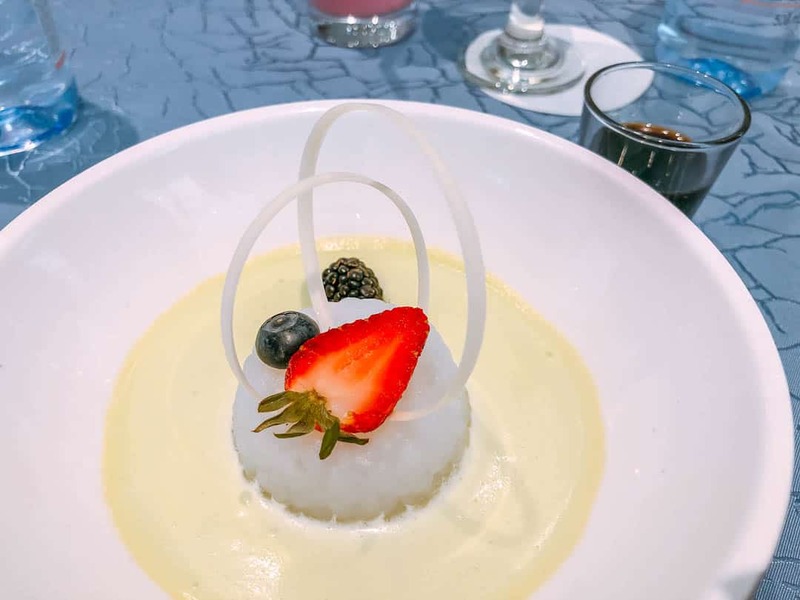 Our coconut milk was flavoured with pandan, but it was the liquid palm sugar that made the dish. Like molasses, this thick, rich sauce took the dish from sago and coconut to a whole new taste sensation. I’m not a fan of Asian desserts, but this one was a superstar. Where is the Dorsett Kuala Lumpur located? The Dorsett Kuala Lumpur is the flagship hotel for the Dorsett brand, part of the WorldHotels portfolio. It was the first built in 1998 and in March 2018 celebrated its 20th birthday. The Pavilion is the major centre in the strip but you will find many other shopping locations like Times Square, Sungei Wang Plaza and the Starhill Gallery in the vicinity. I could find my way around KL, but could imagine getting totally lost inside these centres, designed to keep you in there for as long as possible. The area is also full of lively bars and eating places and the fabulous Bukit Bintang night market. A visit to here is a must. The Dorsett Kuala Lumpur have also embraced the artistic talent of one of their interns, who designed a very useful brochure that we found in our rooms. Not yet officially released, this hand-drawn, fold-out brochure tells guests to “Live like a local”, offering up advice on their favourite places to eat, shop, explore and drink. It’s so much better than the standard location map that is often found in hotel rooms. This one makes me believe what they are telling me and made me want to put it into my bag and start following the trail. We hope we’ve convinced the team at the Dorsett that they should press “print” and make this available to all guests. you can read what others have said about the Dorsett Kuala Lumpur on Tripadvisor. We flew into Kuala Lumpur with Air Asia, arriving into KLIA2 terminal. A trip in the early hours of the morning took 40 minutes but you should allow at least 1-1.5 hours during normal times. If you are driving, there is an undercover carpark and valet parking also if required. Trains and buses also arrive into Kuala Lumpur from other Asian destinations. Always being accessible to public transport is a key strategy of the Dorsett hotels. Beer and Croissants was a guest of WorldHotels. As always, all editorial content, images and opinions are entirely our own.